Was Your Hand Injured At Sea? What Type Of Hand Injury Did You Suffer? 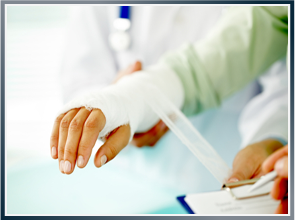 In a hand injury, particularly an amputation, one of the most significant types of damages you can recover is for physical disfigurement and medical expenses. Some amputees may need medical treatment for the rest of their lives; they may suffer from permanent neuromas and permanent cold intolerance, which hinder the victim’s ability to work. They may also need expensive prosthetics or physical therapy. These issues mean the victim could receive money damages for medical expenses, lost wages and future lost wages, including impairment of future earning capacity if the victim cannot return to his or her original job because of the injury. Additionally, hand injury victims can also recover damages for past and future pain and suffering and mental anguish for their injuries. If your hand was injured while you were aboard any ship or boat, our maritime attorneys can help can help you collect damages for past and future medical expenses, lost income and wages, and pain and suffering. Those who are hurt while working aboard a boat or ship need a maritime trial lawyer familiar with admiralty cases. The maritime and Jones Act attorneys at Latti & Anderson LLP have been fighting for the rights of injured maritime workers for nearly a half-century. The maritime trial lawyers at Latti & Anderson LLP work tirelessly to hold negligent parties accountable. Our firm has secured verdicts and settlements of more than $1 million and we can help you receive the money you deserve. If you are seeking legal representation for a hand injury suffered in a maritime setting, contact our maritime and Jones Act attorneys today – we represent clients nationwide.